In the town of Dalai Lama Dharamsala, Buddhism is very much a way of life. Among Buddha-Bazaar.com Online Store Collectables in Indian Art n Craft, this statue is one of our finest figurines in Buddha Idols. The artist has handcrafted the Healing Physician's expression, complimented by the use of toned clothing for good health. 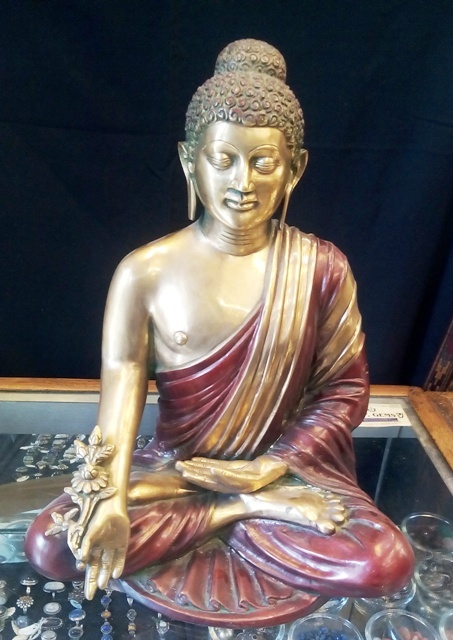 The statue is a bronze figurine, carved by a Buddhist artist from Dharamshala, a product of his vision in our collection of Buddha Statues, Buddhist Idols n Tara Statues in Buddha Bazaar Shop. The Healing Buddha is shown one hand touching Mother Earth and holding the curative herb. Height: 16 inches, Length: 04 inches.